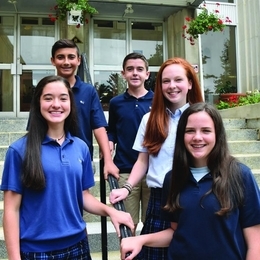 At Notre Dame High School in Lawrenceville, students discover their individuality, a sense of family, and multiple pathways to personal growth. Going to Notre Dame High School in Lawrenceville, N.J., was “an easy choice” for Chad Nelson, a member of the school’s class of 2019. To begin with, his mother graduated from Notre Dame in 1982, so he had a good idea of the education he would receive. Notre Dame prides itself on its ability to educate the whole student—mind, body, and spirit. Rose Stevenson can attest to this fact, based on her experience as one of six Notre Dame College and School Counselors, as well as her perspective as a Notre Dame alumna. Nelson is a fine example. He became heavily involved in athletics, as well as in Campus Ministry, at Notre Dame. He has been a soccer player throughout his time at Notre Dame, having earned a spot on the varsity squad the last two years. He is also a member of the National Honor Society and Catholic Athletes for Christ. As for having a deeper connection with God through Campus Ministry, Nelson says he has found deeper meaning and his “inner self.” As a result, he is pursuing his personal goals—namely, his passion for music—with clear eyes. Like Nelson, Nate Duff is the child of a Notre Dame alum. As a result, he has spent his whole life hearing about the community-oriented nature of life at the school. “When I came here, I knew I was athletic and was good at football,” he says. “But I also have a passion for drawing. My grandfather could draw. Art allows me to express myself and let out my emotions.” Williams drew the logo for the SHADES Club (formerly the African American Club) as well as the logo for Hoops for Hope, an annual student-run fundraiser. An emphasis on intellectual development and community is bolstered by great emotional support, both from fellow students and from the faculty and administration. The ultimate goal: to help students blossom into balanced, confident, and capable adults who are well equipped to take on the challenges ahead. Options for personal growth and discovery abound. From academic clubs and career-oriented programs, to the creative arts and faith-based opportunities, students have the freedom to explore familiar interests as well as develop new ones. Sara Haas, class of 2019 and president of the Student Government, says that Notre Dame has allowed her the freedom to soar to greater heights than she could have imagined. For Nelson, the sky is the limit in terms of what the future holds. He hopes to attend university at a school such as the University of Texas, New York University, the University of Miami, or the University of Michigan, where he hopes to study sports or music marketing. No matter where he goes after graduation, he says he will take the memories of Notre Dame with him. Here’s what other current students say about their experience at Notre Dame High School.